Hank Johnson was elected to the the U.S. House of Representatives in 2006, representing Georgia’s 4th congressional district, replacing Cynthia McKinney. Those were certainly big shoes to fill when it came to bringing embarrassment to the state of Georgia. McKinney provided an endless supply of gaffes and outrageous statements during her 12 years in Congress for late night comedy shows. But Hank Johnson has not disappointed. 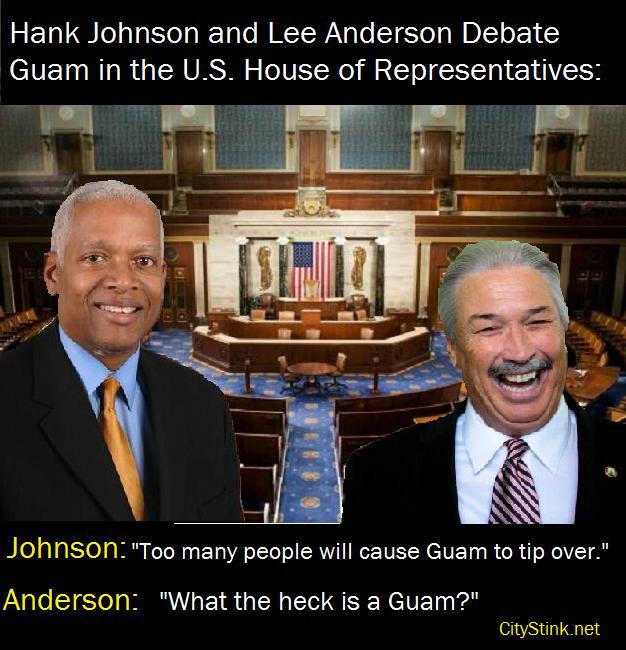 The video of Congressman Johnson voicing his concerns about Guam tipping over received extensive airplay on just about every radio show, and late night comedy show imaginable, from Leno to Jon Stewart to Stephen Colbert. It still pops up today, more than two years later, as a reminder of some of the crazy things that can pop out of the mouths of members of Congress. Anderson was not asked at that debate about his thoughts on Guam, and since he has refused to participate in any debates with his GOP challenger before Tuesday’s runoff and is refusing to go on radio shows and speak to the media in general, we wont be able to ask him . But we have to wonder what his response would be. Would Anderson even know what Guam is? Would he know that it is an island in the Pacific and territory of the United States? What’s Anderson’s position on Guam tipping over? Tagged 12th District Congressional Race, The Outsider. « Furor Over University Name a Gift for Lee Anderson?